PhotoFunia is a fun software that allows you to alter your original photos and edit them the way you want to.You can even add many different effects on them and surprise your friends. This is very easy to use.You just have to upload your photo and choose any effect from hundreds of effects and leave the rest to PhotoFunia. 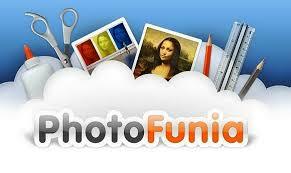 You do not need to download or install anything – everything is taken care by PhotoFunia online. This technology simply identifies the face in the photo and lets you add funny and cool effects. It combines many different pictorial elements in just one picture and gives the illusion that they all belong to one picture.This feature is truly amazing and you can create photo montages and surprise your friends. Now you can add funny effects in your pictures like you can stick your photo on a dollar or create a rainy day or create your picture with a moving fan or burning fire.You can create a nice flowery background or a billboard. A lot of other themes are there to choose from. If you want to convert your photos to sketches, you can use FotoSketcher, and convert your photos to paintings using Psykopaint. So, if you are bored of those pictures lying in your pc,you can give them the magic by altering them and adding cool effects to them. This software is completely free and easy to use. Another great free software that you can try is Foto-Mosaik-Edda.